A group of educators within EUROCLIO network came together in Frankfurt, Germany on 4-6 November to develop a concept and an educational framework for teaching European history through football. This work was done as part of a EUROCLIO initiative to start a new long-term project titled “Football, a People’s History of Europe”. The Project addresses societal challenges through the transformational potential of football and its history. History educators, football historians and pedagogy experts from 15 countries are already involved with the project. The meeting was hosted by Eintracht Frankfurt museum. On Friday 4 November a learning activity testing the pedagogical framework was successfully tested. A non-gymnasium class of 23 students between 13-16 years of age came to the museum for the workshop “World Team Eintracht Frankfurt” piloted by Matthias Thoma. Of 12 boys and 11 girls all had immigrant backgrounds, and some of them had only been in Germany for a year. 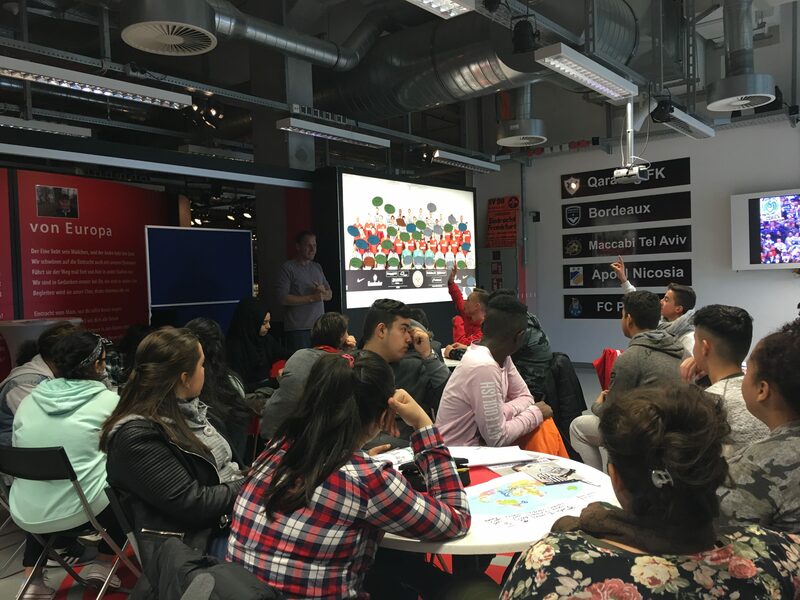 The workshop dealt with the origins of current and previous Eintracht Frankfurt players, and it combined geography and history to teach about the local history of Frankfurt. The feedback from both the students and their teachers were almost unanimously positive. Teachers noted that students profited from active hands-on approach and the whole class was well engaged in the workshop. Students were given a questionnaire to fill out, and based on their answers they found the trip to the museum exciting and the lesson interesting. Even most of the students who stated they were not interested in history estimated the workshop as fascinating. After the workshop the team continued to further develop the concepts of the project as well as other learning activities. On Saturday 5 November, the intensive day of work was concluded with a match between Eintracht Frankfurt and FC Köln. The game ended in a 1-0 victory for Eintracht Frankfurt, and the team members enjoyed the mixture of football and German culture in the stadium. EUROCLIO is expanding partnerships with stakeholders, including clubs, leagues and football organisations to pilot further educational materials. Check the project page for more information about the initiative.